I love this time of year when you make a trip to the garden in the morning and evening just to make sure you haven't missed any zucchini's! I had to laugh this week when I found two baseball bat sized zucchini hidden under a leaf. What's my solution to having too many zucchini's? 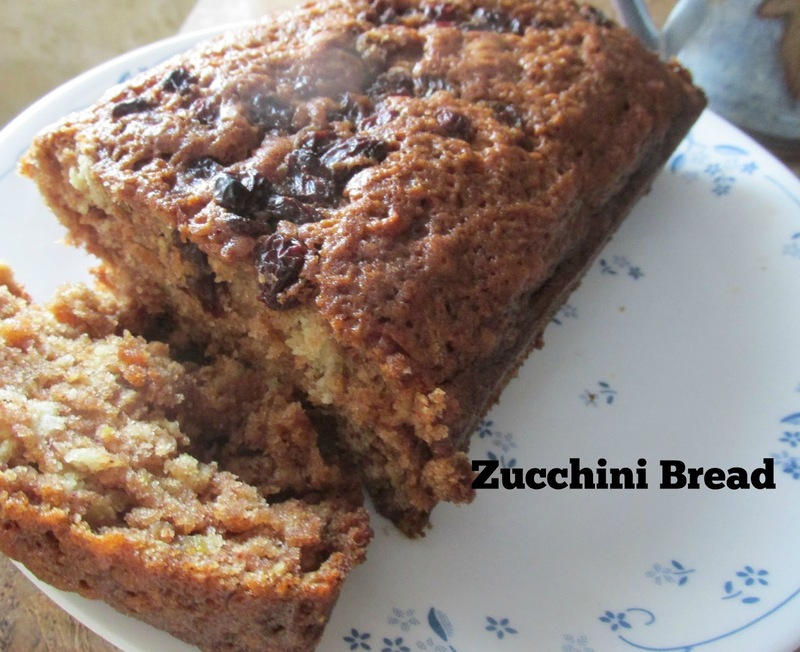 Make this wonderful Zucchini Bread! I love to make a couple of batches at a time. freeze. and pull them out in December when the family has forgotten about them. They get excited about Zucchini bread all over again. In a large bowl mix eggs, oil, sugar, zucchini, and vanilla. Sift together dry ingredients then stir in the wet ingredients. Spray loaf pans with cooking spray and pour half the recipe in to each. Sprinkle each loaf with the raisins or dried cranberries on the top. Bake for 50-60 minutes or until done (toothpick comes out clean) at 350 degrees.